Lorene Mann, a co-founder of the Nashville Songwriters Association International (NSAI), died Friday, May 24. The singer-songwriter was 76 years old. While serving as the organization’s secretary in the early 1970s, she came up with the slogan “It All Begins With a Song.” This remains the motto of the NSAI to this day. Mann was a native of rural Tennessee, born in Huntland, near the Alabama border, on Jan. 4, 1937 as the youngest of 10 children. She began playing guitar at age 12 and moved to Nashville to pursue a songwriting career in 1956. Other Lorene Mann songs recorded include “I Wanna Go to Heaven” (Jerry Wallace), “Don’t Put Your Hands on Me” (Norma Jean, Koko Taylor), “I Loved You Then” (The Wilburn Brothers) and “Beautiful Junk” (Vernon Oxford). She also wrote the “answer” song to Johnny Tillotson, “It Keeps Right on a-Hurtin’ Since I Left.” Her Rex Allen hit “Don’t Go Near the Indians” was also recorded by Marvin Rainwater, Walter Brennan, The Indians Showband and Ben Colder, the comedic alter ego of Sheb Wooley. Her solo RCA singles included her self-written “Have You Ever Wanted To,” “Don’t Put Your Hands on Me,” “You Love Me Too Little” and “Hide My Sin.” The last-named is one of the only country-music abortion songs ever issued by a major label. 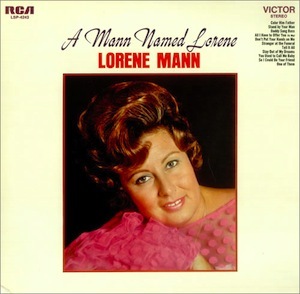 Her 1969 RCA LP, A Mann Named Lorene, include such striking, self-penned songs as “Stranger at the Funeral,” “So I Could Be Your Friend,” “Stay Out of My Dreams,” “You Used to Call Me Baby” and “One of Them,” as well as several of her singles. Lorene Mann scored her biggest hits singing with Archie Campbell on 1968’s “Dark End of the Street” and “Tell It like it Is.” Their duet LP, Archie and Lorene Tell it Like it Is, also appeared in 1968. She appeared as herself in the 1966 movie Music City U.S.A. In the 1975 Burt Reynolds film W.W. and The Dixie Dance Kings, she portrayed one of “The Delores Sisters” singing group. Her television credits in the 1960s included The Bobby Lord Show, Opry Almanac, American Swing-a-Round and The Stu Phillips Show. Lorene Mann is survived by husband Freddie Clay, daughter Karen Clay, two grandchildren and numerous nieces and nephews. A celebration of her life will be conducted at noon today (Tuesday, May 28) in the chapel of Spring Hill Funeral Home. Interment will follow in the Spring Hill Cemetery in Madison.